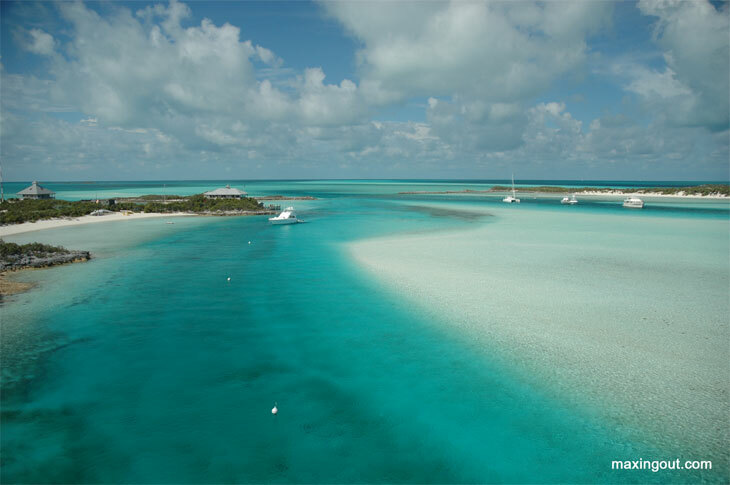 The Exumas Land and Sea Park is Turquoise Land. Turquoise water extends in every direction as far as the eye can see. It's pure turquoise eye candy. Climbing to the top of our mast is a visual treat. Tourists would pay big money to see what I get to see for free. The stated purpose of the park is to preserve natural habitat and aquatic species for future generations. It's also there so everyone can enjoy the turquoise water now. The park rangers want visitors to become hooked on turquoise, because they know that turquoise addicts will move heaven and earth - whatever it takes - to keep Turquoise Land alive. Anchoring is restricted in Turquoise Land so yachts don't destroy the coral and sponges found inside the park. Every time you drop your anchor, the heavy galvanized anchor chain sweeps the seabed clean as the yacht swings to the anchor in the wind and tide. An anchored yacht with plenty of scope out could wipe out large snorkeling areas in just a few hours, and it could take years for the coral and sponges to recover from a few hours of damage. 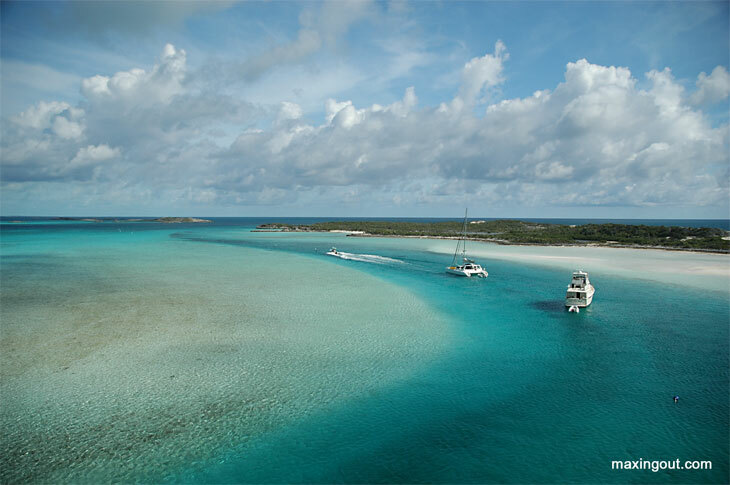 That's why they have moorings in place at Warderick Wells Cay. When a yacht our size comes to visit, it pays ten dollars a night to tie up to a mooring. That's gives the park needed revenue and guarantees the coral and sponges will live to see another day. Everything is protected in the Land and Sea Park. All the fish, lobsters, and sea shells go about their business without having to worry about the most dangerous predator of all, man. When we snorkeled in the southern reaches of the park, we saw a giant lobster scurrying along the bottom in ten feet of water. He was about a mile inside the park boundary, and that's why he's lived long enough to become a mega lobster in his ripe old age. He's off limits to human predators. Protecting large sections of reef are vitally important to the survival of thousands of species of animals who live on those reefs. It's scary to think about how small the protected areas are, and how easily they could be destroyed because of their physically small size. People are slowly waking up around the world, and in Australia, large sections of the Great Barrier Reef are now protected. But even protecting the reefs from fishing doesn't guarantee their survival. When industry on the mainland produces toxic waste or stirs up silt that goes out to sea, the reef can also die. Silt is a bad actor that covers up coral polyps killing them. The world is full of beautiful places. Sometimes the beauty is stark and austere, and sometimes it is as soft as velvet. Wild places are beautiful because there is a balance in nature that keeps them that way. Man doesn't need to maintain the balance of nature; he simply needs to not disturb it, and that's the hard part. We are experts at throwing things out of balance. We are a bit like the Japanese whalers who call their whaling research; we call our encroachment on and destruction of habitat progress and development. Like the whalers, we are disturbing the natural order of things. Places like the Exumas Land and Sea Park are a reminder to us of how beautiful the world can be when we just leave it undisturbed. That's not much to ask of mother nature, but it's a lot to ask from us.